El Hijo del Solitario had been a rudo, but faught with his teammates and turned tecnico here. Multifacetico/Tetsuya feud still being pushed. Freelance looks good in his match and wants a title shot against the Oficials, but he did lose. Chico Che got busted open again. Traumas want a title shot and won, though the win came when Black Terry decided to piledrive Jack. Opener was a sweep for Azteca. After the main event, Veneno stormed out, wondering how IWRG could have a new Corporacion on the next show, since he knew nothing about it owned the trademark. The promoter told Veneno to take it up with the new group, not him. And the twist is, the new Corp is a group of second generation tecnicos. This will not make Veneno happy. For no apparent reason, Dr. Cerebro was Freelance’s second in special non-title singles match. Naturally, Cerebro got carried away and fouled Tetsuya, causing the DQ. Freelance was ticked, and there were three way challenges all around. Gemelos and Chico Che fell apart as a team in the third fall of their title match. Gemelos may be going rudo. 5) Dr. Wagner Jr. & Olimpico DQ Hijo del Cien Caras & Scorpio Jr.
Canek attacked Wagner in the main event for the DQ (no clean pins! ), and to demand a shot at UWA Heavyweight title. Mini Billy Boy! Bryan, whomever that is, does a stripping act. So dancer-hating Konnan walked out and destroyed him and the Apaches lost. Clowns are said to be at 269. Konnan got away with a foul on Parka for the win. Alan Stone is the #2 man in Rey de Reyes. He’s also probably not winning. (RFC) Pancho Tequila won the 50 man Royal Rumble in Arena Coliseo Monterrey. Mr. Niebla chats on Box Y Lucha on 02/09 at 2pm. LuchaWorld has Robert on AULL 08/04/07 (near the peak for them), CMLL GdL 07/29 and 08/05/07 and Rey del Ring 07. Today is the 25th anniversary of Santo’s death. Lots of stories about him all over the place; thiis is just a small sample. – Jornada has two very good articles. One is look back, starting with a story about El Hijo del Santo filming a movie in Cuba, just hours before the revolution. The other is Santo’s last interview before his death, talking about his career in his own words. He explains, before he retired, he passed out three times in the ring and his family got scared. He was sad to go, but the final ovation he got was one of the greatest moments in his life. There’s some strange stuff – his brothers Pantera Negra & Black Guzman are mentioned as passing away in the ring some 40 years before we actually have them dying. Also, Santo does the same “back in my day, we wrestled on the mat – using holds that could kill a man – and now all they do is flying and clown stuff” rant people are still doing 25 years later. Both of those sound too romantic to actually be true. The World of Lucha Libre book mentions a different cause I never see elsewhere: Santo was working as an escape artist and suffered a heart attack during a performance. (It’s kind of mentioned in El Sol de Cuautla’s look back. Ciudad also has a video version of their story. – Ovaciones reprints the obit written 25 years ago. – News agencies EFE & El Universal write about all the festivities in Mexico City and Santo’s home town of Tulancingo. El Hijo del Santo started the day at the DF Santo statute, and he’ll be visiting Tulancingo (and their statue) tomorrow. – WagnerMania has as detailed bio as I’ve seen today. The luchawiki bio is still very good, even if we haven’t done much with it for many years. 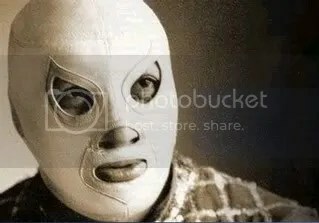 – Box Y Lucha has lots of Santo photos from back in the day. Looking for some way to celebrate the day? If you’re in LA, you can go see Los Campeons de la Lucha Libre and an El Santo movie at the Egyptian Theatre. More info back at this post.